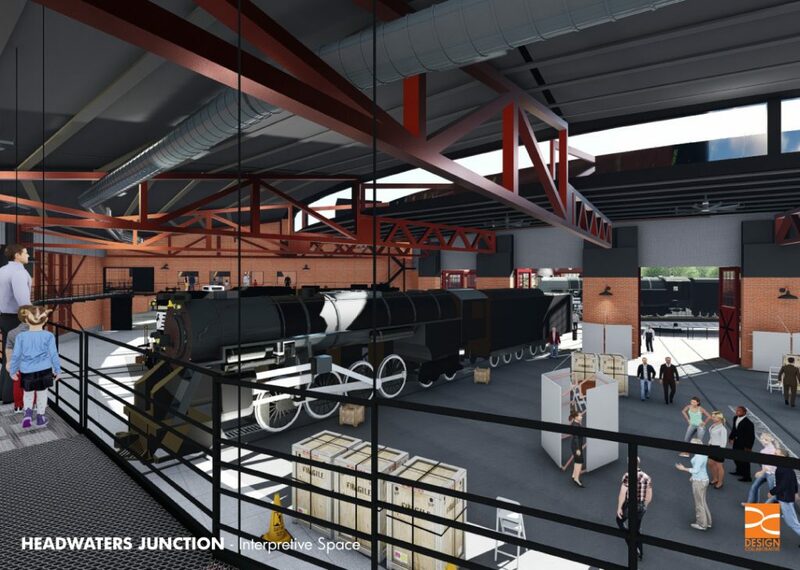 NEW HAVEN, INDIANA – The Fort Wayne Railroad Historical Society (FWRHS) made several important announcements today, revealing a major cosmetic change to historic steam locomotive no. 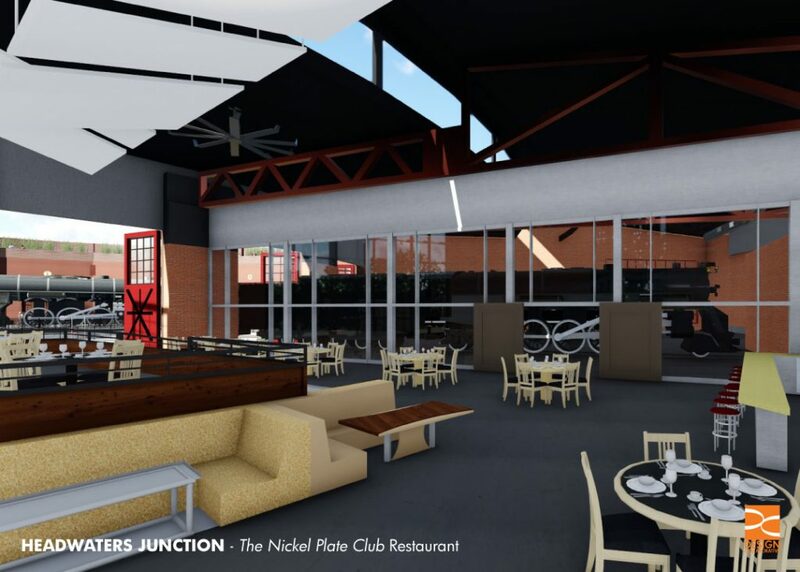 765 and releasing new renderings and information on its riverfront attraction project, Headwaters Junction. “The 765 was preserved by the City of Fort Wayne to recognize how a successful railroad elevation project in the 1950s inspired a half-century’s worth of progress. Today the engine has become an international attraction and can be the centerpiece in a new era of development,” explained Kelly Lynch, Vice President. With its planned annual programming and events and the popularity of railroad attractions like no. 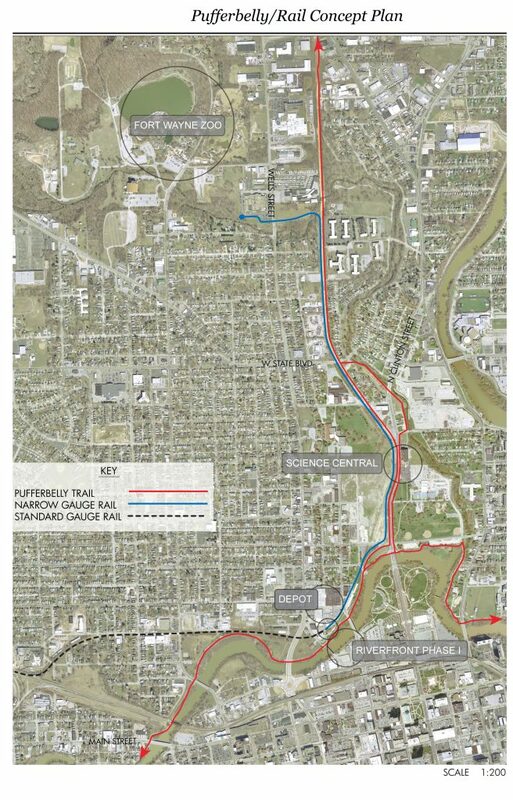 765, the project was endorsed by Legacy Fort Wayne in 2012 and recommended by SWA Group as a catalyst for the riverfront development in 2014. 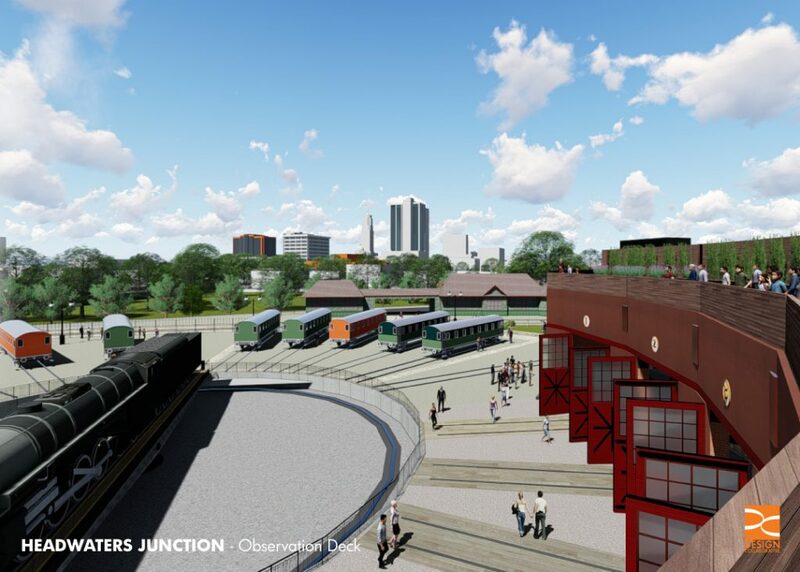 Local developer Don Steininger and the railroad society have created an advisory board of community leaders and a separate non-profit organization to pursue the project. 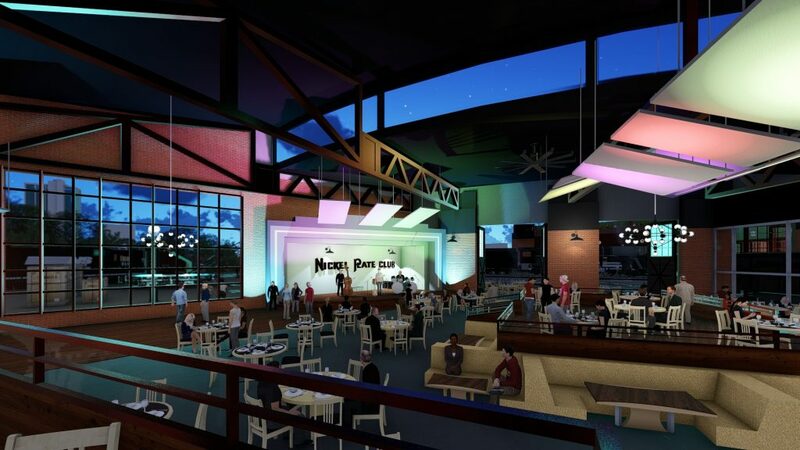 Earlier in 2016, a preliminary study demonstrated that as a stand-alone attraction, it could easily draw 120,000 additional visitors to downtown. 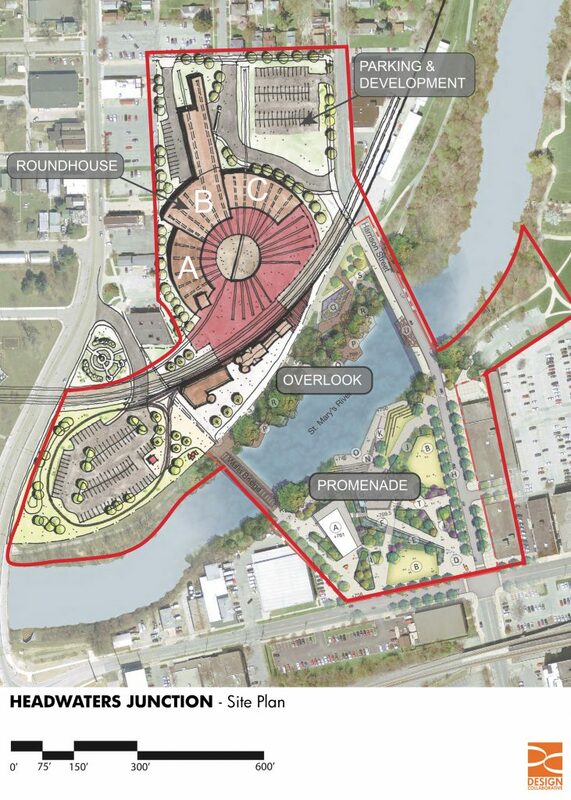 “Our board is excited at the possibilities that Headwaters Junction represents for future riverfront development. 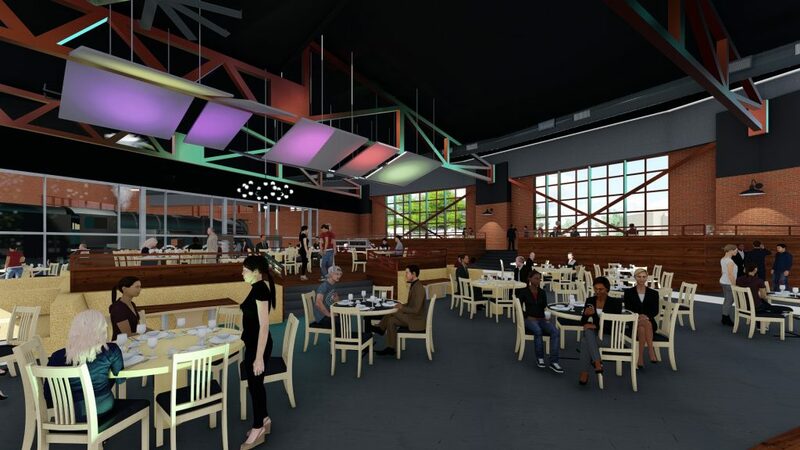 We are aggressively pursuing ways to make this a reality, ” said Steininger. 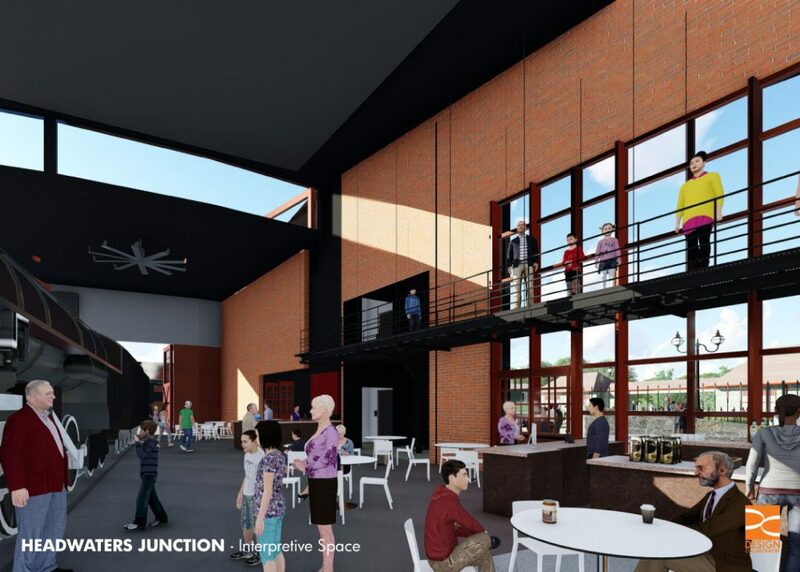 Newly released renderings by Design Collaborative illustrate a mixed-use interpretive facility with event space, a 1940s-inspired restaurant, Cass Street station, rail yard park, turntable and a tourist railroad line connecting the Fort Wayne Children’s Zoo to downtown. 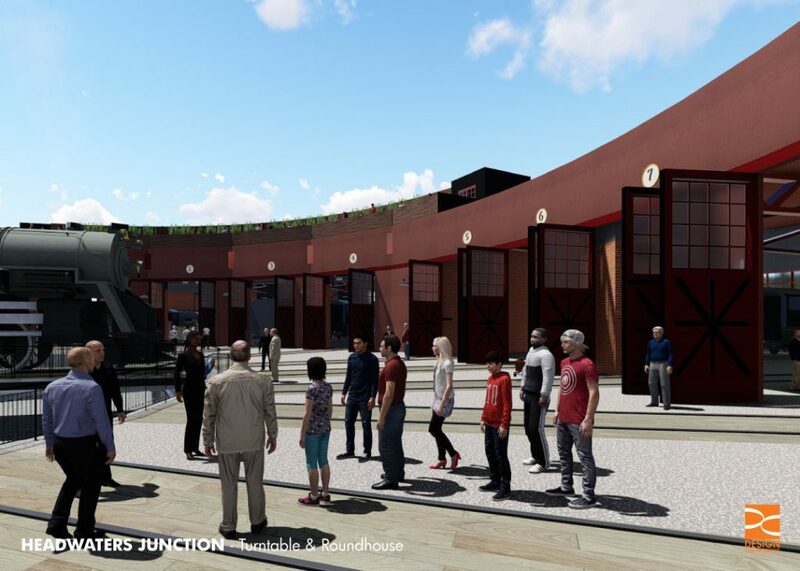 The roundhouse would be located between Harrison and Wells Street. Planned events and programming at Headwaters Junction include regular and special holiday tourist train rides, a Rail Camp for children and young adults combined with other educational programming, visits from Thomas the Tank Engine and the Polar Express, interactive displays, exhibits and visiting historic equipment and much more throughout the year. “Right now we’ll 4,500 people in sixteen hours during our events in December, to say nothing of the thousands more that the 765 draws when it operates. 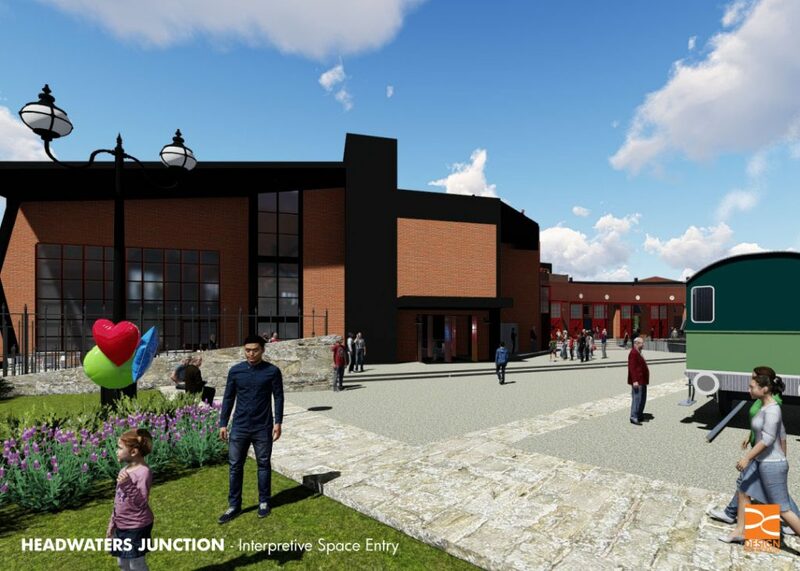 We could multiply our attendance numbers by being able to host regular events, train rides and programs right along the heart of downtown,” said Lynch. Headwaters Junction’s advisory board is currently preparing grant requests and additional study work for this fall. Previous PostJournal Gazette: "Headwaters Junction is iconic, family friendly"